Today marks the 50th anniversary of our country’s motto “In God We Trust”. In God We Trust was placed on United States coins largely because of the increased religious sentiment existing during the American Civil War. Secretary of the Treasury Salmon P. Chase received many appeals from devout Christians throughout the country, urging that the United States recognize God on United States coins. Regardless of how vigorously the American left protests any acknowledgement of the Creator, the very fabric of our country was founded on a strong faith in God. Another legendary athlete honors Dad. Tiger Woods further cemented his legendary PGA status by winning his second straight British Open title (third overall), finishing two shots ahead of Chris DiMarco. He is the first to win two straight Opens since Tom Watson did so in 1982-83. At age 30 years and 7 months, Woods becomes the youngest player to win 11 major championships. Jack Nicklaus was 32 years, 5 months upon winning his 11th. Every time Tiger wins a major, impressive stats such as those can be documented. But it was the sentiments he expressed afterwards on Sunday that made this an even more noteworthy victory. Since the passing of his father Earl in May, Tiger struggled to regain the mental toughness that has defined his illustrious career. He even missed the cut in last month’s US Open, the first time that has ever happened to Tiger in a major. So upon winning his first tournament since Earl’s death, Tiger embraced caddie Steve Williams and sobbed uncontrollably. While witnessing this I couldn’t help but be struck by the similarities of this moment to what took place on Fathers Day, 1996. Another legendary athlete, NBA superstar Michael Jordan, helped his Chicago Bulls clinch the NBA championship on June 16, 1996. It was Michael’s fourth NBA championship, but the first title since the tragic death of his father James in 1993. Combine that with it being Fathers Day, Jordan spent several minutes after the game crying face down on the locker room floor. It appeared he was overcome with emotion on his dad not being there. Yes, we often revere these athletes for their remarkable skill. But I equally admire their ability to show raw human emotion upon completing another conquest. I have a feeling we’ll see many more championships in the future of one Eldrick “Tiger” Woods. The Minnesota Twins start a key six-game road trip this evening when they take on the Cleveland Indians. The Twins will play three games against the Indians this weekend and three more next week in Chicago against the White Sox. Although the Twins have been phenomenal at home (37-11) they have been woeful on the road (17-29, including 0-12 against AL Central foes Indians, Sox and Detroit Tigers). This will be the trip which will determine what the Twins will do at the July 31st trading deadline. If the Twins have a good road trip (Say, 4-2 or better) they may retain all of their players for the stretch drive. If they go .500 or worse? Hey, I’m not looking to rain on any parades here. The mere fact I am talking about a Twins playoff run this season is remarkable considering a couple of months ago I was calling for management to blow up the team. The Twins have gone a scorching 29-7 in their last 36 games so I say enjoy it while it lasts. Even if Twins are virtually eliminated from the playoffs, there are still a lot of aspects of this club which are worth paying attention. -Joe Mauer attempting to be the first catcher in a long time to win a batting title. The last to do it? You have to go all the way back to 1942 when Cincinnati Reds backstop Ernie Lombardi accomplished that feat. -Justin Morneau becoming the first Twin to hit 30+ home runs since 1987. He also has a very good chance to become the first Twins player to hit 40+ since…what was that guy’s name?.....Oh yeah, Harmon Killebrew. -Francisco Liriano has an opportunity not only to win the AL Rookie of the Year but also the Cy Young award. Not a bad double play for a rook. -Liriano and Johan Santana have the opportunity to become only the second pair of Twins teammates to win 20 games in the same season. Dave Boswell and Jim Perry each won 20 way back in 1969. The 2006 version of the Minnesota Twins have been fun to watch! Random thoughts on a slow sports night. There are only two days throughout the entire year when none of the four major professional sports (MLB, NFL, NBA & NHL) has a game scheduled. Those days would be the Monday before and the Wednesday after the Major League Baseball All-Star Game. This year’s game will take place this evening at PNC Park in Pittsburgh. Despite the lack of sports competition on Monday, I felt the urge to compile a blog post featuring some obscure trivia about America’s pass time. What better time to do so then on the eve of baseball’s Mid-Summer classic. -On September 22, 1987, the Chicago Cubs send P Dickie Noles to the Detroit Tigers for a player to be named later. Noles is the player to be named later, going back to Chicago on October 23. -In 1998 the New York Yankees compiled a record of 125 wins and 50 losses (including post season play). That is a winning percentage of .714. The most famous Yankee of all-time, Babe Ruth, is third on the career home run list….with 714. -In 1974, Atlanta’s Hank Aaron surpassed Ruth on the all-time home run list by hitting his 715th career homer in an April game against the Los Angeles Dodgers. In 1985, Cincinnati’s Pete Rose surpassed Ty Cobb on the all-time hits list with his 4,192nd base hit in a September contest versus the San Diego Padres. The Dodgers first baseman in 1974? Steve Garvey. The Padres first baseman in 1985? The same Steve Garvey. -In 1993, Rickey Henderson was traded from the Oakland A’s to the Toronto Blue Jays, where Henderson helped the Jays win the World Series. John Olerud, the Jays first baseman that season, wore a batting helmet while playing the field. This was done as a precaution due to having suffered a brain aneurysm while in college a few years earlier. Fast forward to 1999, where Olerud was playing for the New York Mets. Later that season Henderson is traded to the Mets. Upon seeing Olerud working out prior to a game, Henderson says something to the effect of “Hey, I used to have a teammate in Toronto who wore a batting helmet in the field, too.” Olerud replied “Yeah, Rickey. That was me.” Yes, this is the same Rickey Henderson who allegedly took practice swings in the locker room in front of a mirror completely naked while repeatedly saying "Rickey's the best! You tha' man Rickey!" -In September 1990, I attended a Minnesota Twins game where they were hosting the Texas Rangers. A friend of mine scored great seats along the first base line. While feigning interest in a meaningless game featuring my last place Twins, I noticed a group of well-dressed men walking down the steps near our seats. These men were escorting the owner of the Texas Rangers to his seat. I later came to find out that these men in suits and ties were Secret Service agents and the owner of the Rangers also happened to be the son of the President of the United States. Yes, George W. Bush was within 50 feet of where we were sitting that evening. Who would have thought that 10 ½ years later, he himself would become President? Well, another half-year in the books. Can you believe it? The end of the first six months of a year are quite tumultuous for me in my profession. I work in the Finance industry for a Twin Cities company which means I spent the past week closing the books for the first half-year. Yes, there’s nothing worse than an impudent Brit. Anyhow, since July 3 & 4 were holidays, I had three days to complete my work as opposed to the normally allotted five. Friday, July 7 marked six years of wedded bliss for my gal & me! I just realized that next year will be extra special. On 07/07/07 we will celebrate 7 years!! That’s quite the statistical anomaly. All right, already! I get it! Anyhow, given the veritable whirlwind that was my work week last week, I ended up working until 8:30 pm on Friday evening --- MY ANNIVERSARY! Ah, but there was never any need for panic on my part. In fact, I had a nice meal waiting for me upon my arrival Friday evening. Wow, am I married to great gal or what??!! OK, what did you have to do to make up for being late? *OK, I promised a special vacation getaway on our 10th anniversary. Who's afraid of the big, bad goose? It was about 1994 when I was leaving my apartment in New Brighton one summer evening. I was walking to my car when I heard this shuffling noise in the grass. I turned around to see three Canadian geese sauntering towards me, hissing all the while. I was able to retreat into my car before the geese were able to reach me. All I could think about was Alfred Hitchcock’s movie “The Birds”, a film depicting our fine feathered friends (in that case, seagulls) running amok by attacking humans. Over the next 10-plus years, I didn’t have many occasions where I encountered the long-necked creatures. That is, until 2004 when I began employment at a Maple Grove office building near a pond. Near this particular body of water dwells a plethora of these geese. Each morning upon my arrival to work I always keep a sharp eye out for these devilish creatures. 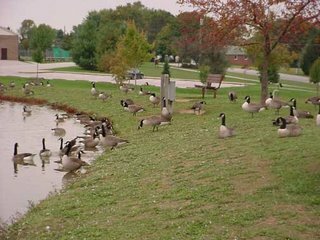 I am usually able to arrive at a time where the geese are gathering at a safe distance away from the two entrances near where I park. On Saturday I had to tend to a couple of things at my office. Since I never fancy working on weekends, I didn’t arrive until 11:00 am. By that time, two large flocks of Canadian geese “manned” each entrance that I was attempting to approach. As I started to pull into a parking spot nearest to one of the entrances, there were two geese that ran towards my vehicle. Oh, I recognized that look. They were indeed hissing with all the vigor I witnessed in 1994. I felt trapped. I couldn’t go in either of the back entrances which were closest to my office. I drove around to the front of the building, where I proceeded to use that entrance. I completed my hour of work and was ready to leave. Since I was the only person in the building, I would have to set the alarm before leaving. The dilemma I faced was setting the alarm and exiting within 30 seconds. The alarm panel was on the back door which meant I had to arm the building and run out the front door all within the allotted half minute. If I didn’t get out of the building in the time permitted, the Maple Grove police would have responded to a burglary call in our office building. I then would’ve had to explain to Maple Grove’s finest that I was an employee of the company occupying said building. That would have resulted in me calling someone in management at home on a Holiday weekend. In turn, management would have begrudgingly come to the office and vouched for me. All of that due to my irrational fear of Canadian geese.